BROWNSBURG, Ind. (May 28, 2013) – Ron Capps’ appreciation for history makes every event at Old Bridge Township Raceway Park special for him. 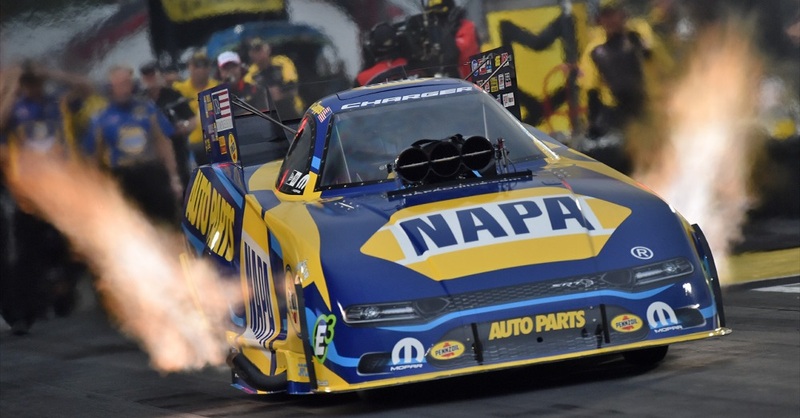 And a year ago at the track at Englishtown, N.J., the veteran Funny Car driver was able to add to the track’s lore.Capps and Don Schumacher Racing’s NAPA AUTO PARTS Dodge Charger R/T led by crew chief Rahn Tobler and assistant John Collins uncorked a qualifying run of 3.964 seconds at 320.89 mph that remains the quickest Funny Car run ever. “It seemed like everyone I signed an autograph for the rest of the weekend wanted me to put ‘3.96’ behind my name. That was cool,” Capps said. In NHRA, in order to set a national record Capps needed to run within 1 percent of the 3.964 before leaving Englishtown to earn the NHRA elapsed-time national record but weather conditions were not conducive to it. “We’re not even thinking about a record,” Capps said. 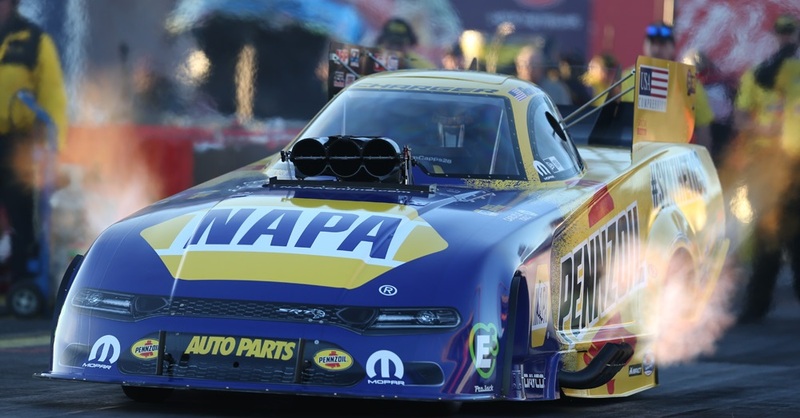 “We were focused on getting NAPA AUTO PARTS another trophy. “That’s our approach for this weekend. If the conditions are right, like they were last year at Englishtown, Rahn might load it up. But our focus is to go rounds and get the Wally (trophy). 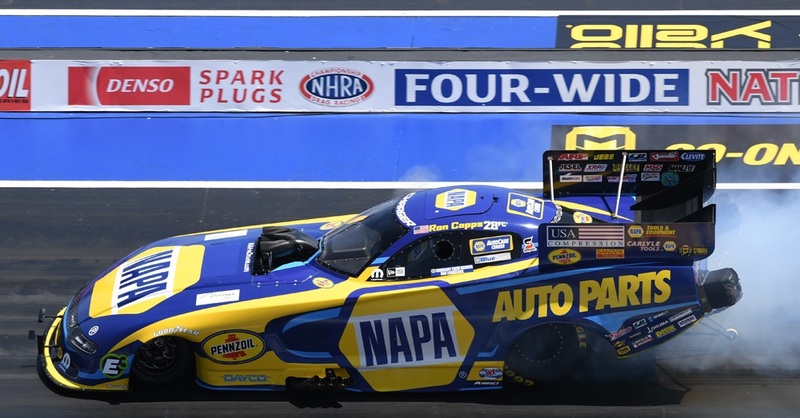 Capps came up a little short at Englishtown when he lost to DSR teammate Johnny Gray, but it was the fourth championship round of six straight for the team. Another DSR driver, Spencer Massey, produced the quickest ever Top Fuel run on the same Friday. “I’ve never had a night like that,” said team owner Don Schumacher, who won the Funny Car title at Englishtown in 1972. “I’ve had some of my teams perform extraordinarily well but never had them change Top Fuel and Funny Car marks like that on one night. Schumacher, 68, was inducted on May 2, 2013, into the International Motorsports Hall of Fame at Talladega (Ala.) Superspeedway with NASCAR stalwarts Rusty Wallace, Rick Hendrick and Dale Inman. 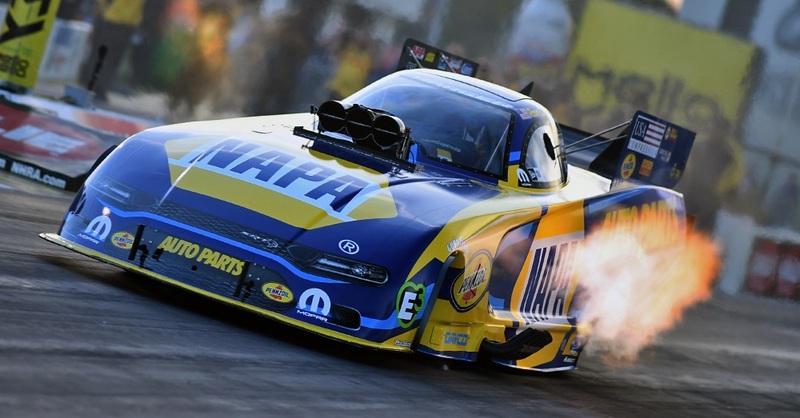 JOIN US FOR THE RACES: Watch NHRA Englishtown Qualifying on Saturday, June 1st at 5:00 p.m. on ESPN2. Catch the final eliminations on Sunday at 4:30 p.m. on ESPN2. The seven-team Don Schumacher Racing organization is off to a hotter start than a year ago when it won 22 of a possible 46 NHRA national event titles and two world championships (Antron Brown in Top Fuel and Beckman in Funny Car). After eight Mello Yello events and heading to New Jersey last year, DSR had won 4 Top Fuel and 2 Funny Car titles for a total of 6 out of a possible 16. Upon returning to E-Town this week, DSR has won 5 Top Fuel and 5 Funny Car titles for a total of 10 … a whopping 62.6 percent of a possible 16 event titles. DSR also ranks first in Top Fuel (Schumacher) and Funny Car (Gray) with three of its teams in the top-four in Top Fuel and three in the top-four in Funny Car including Capps, who is No. 4. DSR holds all four NHRA nitro national records: in Top Fuel, elapsed time (3.701 sec., Antron Brown) and speed (332.18 mph, Massey); and in Funny Car, elapsed time (3.986 sec., Beckman) and speed (320.58 mph, Beckman). 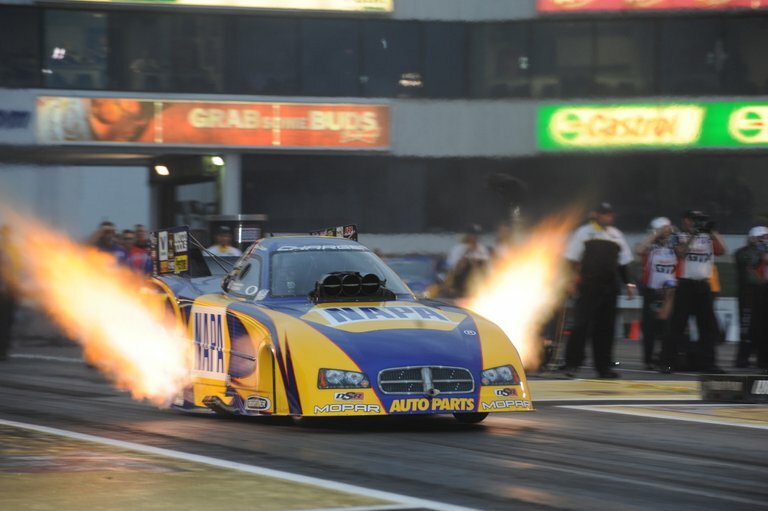 CAPPS’ TRACK STATS FOR ENGLISHTOWN, N.J.